A glasses free eye is a dream of every glass wearing individual. Our hospital has fulfilled this dream for hundreds of individual in past few years under the experience heads of Dr. Chalini Madhivanan this wing has become a state of art center for LASIK and other refractive surgeries. Different procedures available are Myopic, Hyperopic and Astigmatism LASIK and LASEK for thin cornea, Conductive Keratoplasty for presbiopic patients. Facility for phakic IOL or Intra ocular contact lens(ICL) for very high Myopia is also available. Our centre is equipped with Nidek EC5000 with navex platform for customizing each case of laser and is state of the art equipment. We are having the state of the art technology for Refractory correction by LASIK laser correction. High powers and astigmatism can be corrected. Implantable Contact lens for eyes not fit for laser correction can also be done. Normal rays of light entering the eyes are brought to precise focus on retina-the light sensitive layer lining the back of the eye. When such a focus is not achieved, a refractive error results and vision is not clear. When light rays are focused in FRONT of the retina, the resulting condition is termed MYOPIA (Short-sightedness). In HYPEROPIA (Long-sightedness) the light rays come to focus BEHIND the retina. 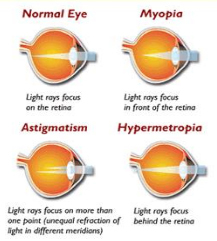 ASTIGMATISM (Cylindrical error) occurs when incoming light rays unable to reach a common focus within the eye. Corneal topography is a non invasive imaging technique for mapping the surface of the cornea. It extends the measurement range from the four points a few millimeters apart that is offered by keratometry to a grid of thousands points covering the entire cornea in seconds and is completely painless. 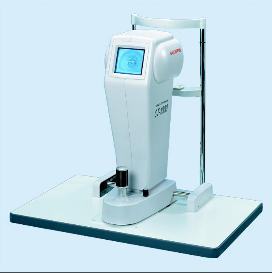 It is a 5 in 1 true refractive workstation combining wavefront aberrometer, Topographer, auto-refractometer, Auto-keratometer, pupillometer and pupillographer. It determines the best strategy for vision correction. 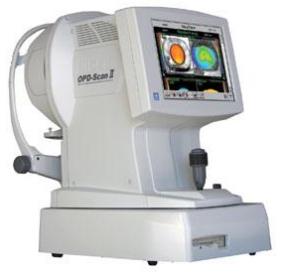 All the wavefront details are connected to the Laser machine and Customized laser ablation is done Detection of earliest signs of abnormal cornea (Keratoconus) can be made out. It has 33Blue placedo mires, which provide a minimum of 11,880 data points. 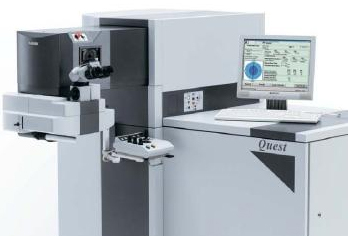 The Nidek EC-5000 Excimer Laser System is approved for topography-assisted LASIK treatment using the Final Fit™ custom ablation treatment planning software, for the reduction or elimination of Refractive errors. From -0.50 to -10.0 diopters with astigmatic refractive errors more than -0.5 diopters up to -6.0 diopters . Stable refraction for a year is mandatory. The Procedure will take less than half an hour for both eyes together. It will be done under Topical anaesthetic drops ( NO Injections, NO Pain, NO Bandage). Corneal Collagen Crosslinking with Riboflavin (CXL) is a well proven keratoconus treatment. Keratoconus is an ectatic corneal pathology weakening the corneal fibers. CXL works by increasing collagen crosslinks thereby strengthening the cornea and stabalising the cone. During the corneal crosslinking treatment, custom-made riboflavin drops saturate the cornea, which is then activated by ultraviolet light. This tecnique arrest progression of keratoconus, and thereby prevent further deterioration in vision and the need for corneal transplantation. Glasses or contact lenses will still be needed following the cross-linking treatment (although a change in the prescription may be required) but it is hoped that it could limit further deterioration of vision. Nearsighted, including those with mild, moderate, and severe myopia (as low as -3D to as high as -20D prescription) with minor or no occurrence of astigmatism. Stable refraction for a year. Better to avoid in pregnant and Lactating women ,Severe allergic disorders, and in mismatching parameters. It involves a micro incision through which a foldable ICL is implanted under topical anaesthetic drops. When LASIK should not be done? Patients with recurrent corneal erosion. Patients with collagen vascular, autoimmune or immunodeficiency diseases. Patients with thin and cone-shaped bulging of the cornea (keratoconus). You should be able to see reasonably well immediately the very next day after your procedure. If you have had a ASA, your eye will be patched for 24 hrs following which your vision will become clear . In either procedure the clarity of vision will improve as the healing takes place. Early effects MAY include Light sensitivity or glare. If you had ASA, you can return in 4-5 days time and if you had LASIK done you can return to work from the next day. The eye medication should be applied as per schedule and there should be no trauma or water falling inside the eye for a week. How often I should come for check up? You will have to come on the 1st Post operative day and then after a week later and then after 1 month . 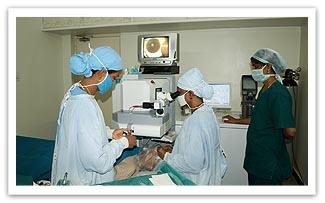 After that you will have to visit once a year to examine your retina.